Home Politics POLITICAL ALARM: ROCHAS OKOROCHA LAUNCHES FAKE ARMY, POLICE BRANDED VEHICLES, READY TO UNLEASH TERROR ON IMO ELECTORATE TO SECURE SENATE SEAT, GOVERNORSHIP. POLITICAL ALARM: ROCHAS OKOROCHA LAUNCHES FAKE ARMY, POLICE BRANDED VEHICLES, READY TO UNLEASH TERROR ON IMO ELECTORATE TO SECURE SENATE SEAT, GOVERNORSHIP. While Nigerians are ruing over postponed presidential and national assembly election, barely three days, the Deputy Governor of Imo State, Prince Eze Madumere raised alarm over Governor Anayo Okorocha’s desperation to foist himself on the people of Orlu zone for senate and his son-in-law, Uche Nwosu as his successor, yesterday; he was caught pant down with fake branded army and police vehicles. This has vindicated Madumere for pointing a finger towards Okorocha and his preparedness to trigger political violence of no small magnitude, while addressing American Election Observers. Newstrack undercover correspondent has revealed that the vehicles were branded to transport trained militia group and other thugs who will be dressed in fake police and army uniforms. These fake army and police branded vehicles were first tested with Okorocha’s convoy on Friday day night heralding Saturday, which was to be an election day. Unsuspecting Imolites had mistaken the convoy for INEC sensitive materials under the guide and protection of army and police troops, only to discover that armed to the teeth dangerous looking personnel were only hoodlums dressed in fake uniforms. It will be recalled that Imo Police command had paraded miscreants in army uniform last week who were also alleged to have been hired by Okorocha. It was also reported that some thugs who were camped in one of the loyalists of Okorocha and the CEO of Imo Concorde hotel (name withheld) whose house is a camp to hired thugs and militia was burst with some of the hoodlums in custody while others are at large. 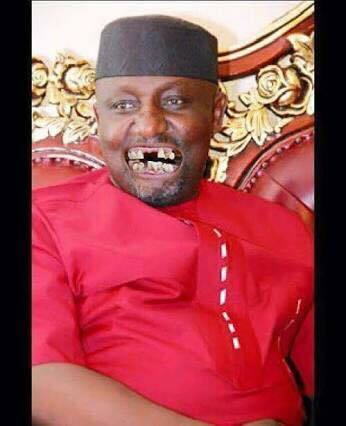 Okorocha at various for a had never pretended over his desperation and readiness to spill blood should he not have his way to emerge winner of Imo West senatorial seat and emergence of his son-in-law as next governor of the state despite resistance of Imo people. Our investigator under a threatening arrangement was able to trace the suspicious vehicles to Okorocha’s Owerri mansion where the vehicles are being branded whereas some of the hoodlums are camped in his Rochas International Foundation College also within the same complex. Meanwhile, most of the branded vehicles to deceive the unsuspecting electorate have been moved to Okorocha’s Ogboko country home. Our reporter also traced others to Ohaji-Egbema, Umuowa in Orlu local government area of Imo State and troop of other marauders to Okorocha’s country home in Ogboko, Ideato South local government of Imo State. One Mr. Frank Onwumere, Senior Special Assistant to the Governor on Imo Community Watch and the chief trainer, one huge Mr. Okorocha have been the commanders of both the state arranged security and the newly hired hoodlums, which include, IPOM militia group, militant groups and gangs of various cult groups.